The Forex Heatmap® is real time currency strength meter with second by second updates. It is a server/web based meter so a trader does not have to have any programming skills at all to use it, just plug and play. It displays on a web page or any browser, tablet, or mobile phone. This currency strength meter is not an app, it is web based and works fine on Android and IOS mobile operating systems, like an IPhone or Ipad. The readings on our meter are accurate to 0.01% of the price movement, very high precision. The Forex Heatmap® currency strength meter also has a second heatmap that functions as a fully redundant backup system. In case the heatmap has an outage, traders can switch to the backup system for seamless trading signals. Our currency strength meter also has an alert system that tells you when the signals are consistent for trading, also in real time. Our currency strength meter/indicator works for 8 different currencies and a total of 28 currency pairs: USD, CAD, EUR, GBP, CHF, JPY, AUD and NZD pair combinations can all be traded with this meter. Here is a screenshot of one of the 8 currencies in our currency strength meter, The Forex Heatmap®. This is the Canadian Dollar (CAD) pairs. The meter shown is for the main trading session, we also have one for the Asian session for each currency. Clearly, the CAD had consistent strength across all pairs. This meter also specified the CAD/JPY as the primary pair to trade, since there was slight JPY weakness also in the market. Most forex trading signals are difficult to interpret, but with The Forex Heatmap®, even beginner forex traders can interpret how to buy and sell 28 pairs in real time. This consistent CAD strength and CAD/JPY buy signal caused strong movement on this pair. Movements of 1% or more on any pair is a large movement, up to 125 pips on pairs like the CAD/JPY. Movement cycles of over 200 pips in one trading session are possible on many pairs out of the 28 on the meter. The meter looks the same for the other 7 currencies, with seven pairs per currency grouping. They currency groups are all stacked on top of each other so you can see all 8 currencies and 28 pairs on one screen. Basing the heatmap on the forex trading sessions is another big advantage. In the example above, the CAD strength started in the main session and the movement progressed in the most liquid part of the forex trading day. This occurs often with all 8 currencies, almost every day in the main trading session. Here is another example currency strength meter signal, and this time you can see how the pair moved also. 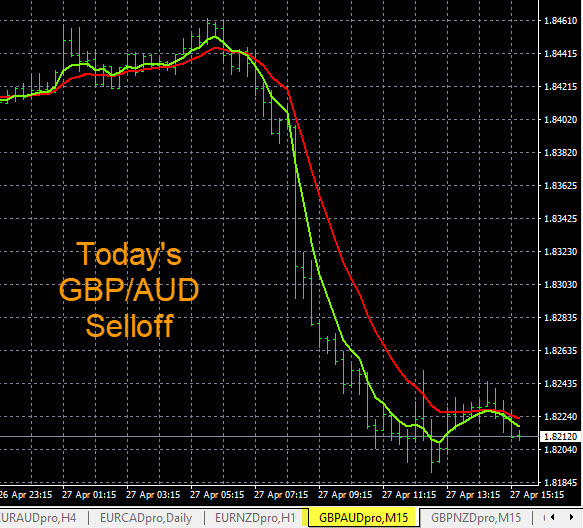 The GBP was consolidating, then started to drop in the main trading session. The other currencies were neutral on the meter, so every single GBP pair had nice movements based on GBP weakness. The GBP pairs are volatile. The GBP/AUD selloff was about over 200 pips in less than 8 hours, and all 7 GBP pairs combines movement was over 1000 pips. This is the kind of results traders are looking for. Easy to read signals and lots of pips on the more volatile pairs. The heatmap currency strength meter also has a built in alert system that is based on the readings from the heatmap meter. The alert system notifies the end user when the heatmap meter signals are consistent for trading. The alert system is also in real time and server based. 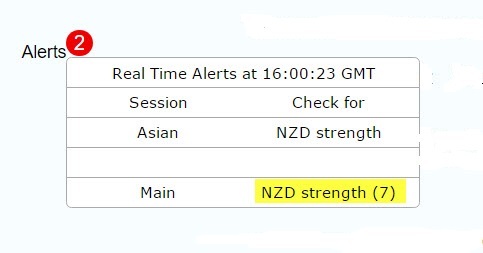 In the example below if you see an alert that says NZD strength (7), it means that all of the NZD pairs are moving based on NZD strength, and the strength is consistent across all 7 pairs. In this case you would check the heatmap meter to see what pair was best to sell, along with the trends and time frames. For example, if the NZD/USD is trending up with no resistance nearby, that would be an excellent choice for a buy. You can learn more details about our currency strength meter alert system and how it can help you with your trading. If you use our high precision currency strength meter on any trade entry, you will likely increase your trading accuracy and pip totals. But if you use the meter to enter a trade on a pair that is trending, you now have a chance to hold on to the trade until the trend is over. Using the meter as part of a complete, trend based trading system is the best approach. If a trader analyzes the market carefully with multiple time frame analysis, they will know if any trade entry is an intraday trade (day trade), swing trade or position/trend trade. If you set up our trend indicator system, then you can categorize your trades by trading style. When you enter a trade on a pair that is not trending, the heatmap currency strength meter can still give you a profitable entry, but since the pair is not trending it may only be a short term intraday trade or daytrade. By contrast some trade entries might be on pairs in strong trends or possibly on developing trends. We believe that all forex traders should use a currency strength meter on all of their trade entries. We believe that The Forex Heatmap® is the best currency strength meter available to retail traders, with the most advanced features. Also, the signals are easy to interpret, even for beginner forex traders. When a trader uses a strength meter as part of complete, trend based trading system, then it unlocks the full profit potential of 8 currencies and 28 pairs. Do you like this article? Click on the link to learn more about The Forex Heatmap®.